Hot Hits 'N Cool Numbers by the best Pan-Round-The-Neck Steelband. 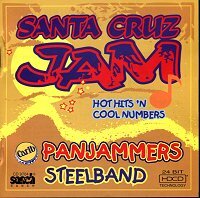 Steelband music from its source and Panjammers add another first to its list: SANTA CRUZ JAM is the first steelband recording done with the High Definition Compatible Digital (HDCD) process. Capture the essence of traditional steelband in this first CD by Panjammers playing Calypso, pop songs, Latin hits and traditional "tourist numbers". When you listen to this CD on a good system you'll feel as if you're in the middle of a live performance! Sixty-eight minutes of it.